This week's Sports Illustrated features a number of stories dedicated to power including an illustration of the power players in sports inspired by the power-obsessed HBO series Game of Thrones. As we learned last May, George R.R. Martin, the fantasy novelist behind Thrones, is a huge NFL fan, watching his beloved New York Giants weekly from his home in Santa Fe, New Mexico. Last week SI Video producer Nolan Thomas and I checked in with Martin for a podcast on a number of sports-related subjects, including the parallels he sees between Thrones and the sports world. Below are excerpts from the podcast; to hear the full interview, use the player to the right or subscribe on iTunes. SI.com: The most powerful person on our power list is NFL commissioner Roger Goodell. 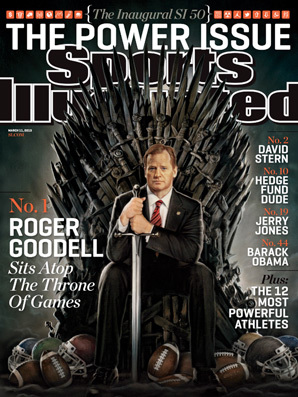 Do you see any parallels with Goodell and Joffrey Baratheon? Martin: Well, I like Goodell and I don't like Joffrey so much so I would not necessarily draw an analogy between the two of them (laughs). SI.com: The athlete atop our athlete power list is LeBron James. Who is the equivalent of LeBron in your universe? Martin: Well, LeBron James is the greatest active basketball player I suppose so the parallel in Westeros would be who is the greatest active swordsman. You can make a case for Jamie Lannister. You can make a case for The Hound or his brother Ser Gregor [Clegane] or Sir Loras [Tyrell], the Knight of Flowers. These are all first class Knights. Or even Ser Barristan The Bold [Sir Barristan Selmy]. These are all guys who are top at their own particular sport, which is swordsmanship and jousting, and all of the combat skills that attend knighthood. SI.com: How often does sports enter your mind as you are writing? Martin: Sometimes, I think about it. In the Ice and Fire books, there is a lot of analogy between what the knights do and what modern football players or boxers or people in other combat-related sports do. A medieval knight trained every day. They did not have Nautilus machines or weight training but they were in the yard practicing with their swords and shields, riding at each other on the jousting field. It was a constant regimen of training to keep themselves in top shape. And there was a huge interest in jousting. When a tournament was held, people turned out by the tens of thousands to watch that, and there was heavy wagering on which Knight would win. I sometimes use this when talking to fans. I get fans who ask me, "Who is the best warrior, or who would win in a sword fight between this character or this character?" My answer is always is that it depends on the day. You have to use sports as an analogy. Yes, you can say Johnny Unitas was a great quarterback but it doesn't mean he won every time. He lost some games. The greatest boxers lost occasionally. Even Man o' War was defeated once in a horse race. So we can rank these swordsman and we can rank the knights and we can say who is good or who is bad but still an upset is possible. Of course with knights, if you get upset, you may die or have a limb hacked off. They are playing a sport that is very dangerous. SI.com: For you the Starks are heroes, and you told us a couple of months ago that they would be the NFL equivalent of the Giants since the Giants are your team. If we extrapolate this, who is Eli Manning in your universe? Martin: Eli Manning would probably be someone like Loras Tyrell, the Knight of Flowers, who has a bigger brother, Lord Garlan Tyrell, who is an even better swordsman than he is (laughs). So you have that brotherhood relationship there. SI.com: Is there a sports team that is parallel to the Lannisters or the Targaryens? Martin: Being a fan of the Giants and also the Jets, the two teams that I hate of course are the Dallas Cowboys in the NFC and the Patriots in the AFC. So I tend to identify them with the villains in some cases. These are both very powerful institutions, very rich institutions as The Lannisters are rich. I think the Cowboys are the most valuable franchise in the NFL and the Patriots are up there, too. They have very powerful owners and they exercise a lot of power in the league. Both Robert Kraft and Jerry Jones carry a lot of sway. Even the Commissioner does not disregard them lightly. And they use their power for ill! SI.com: Am I wrong to see Bill Belichick as a Lannister? Martin: I call him Evil Little Bill on my blog so in some ways he might be worse than a Lannister. Maybe he's a Greyjoy.